Free Santa Letters.net - free printable Santa letters in minutes! Print free Santa letters at home! 1) Select one of three letters from Santa that you can personalize with your child’s information. 2) Select one of three colorful Christmas background images. 3) Add your child’s personal details and approve the preview of your letter. 4) Enter your email and then select the free low-resolution letter or premium high-resolution letter with envelope and Nice List certificate. 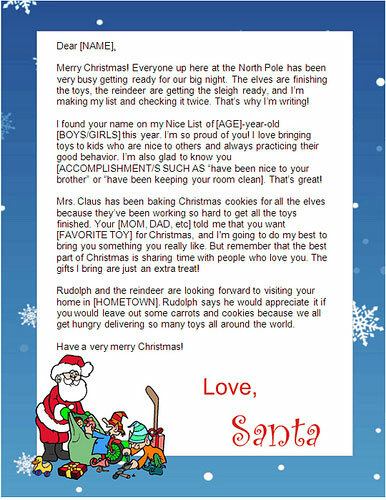 Then get the link to print your Santa letter! 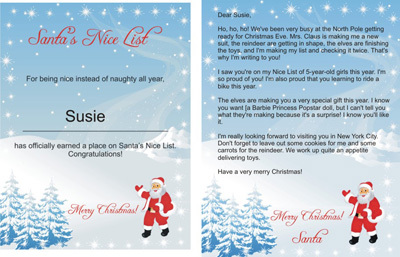 Why choose Free Santa Letters.net? – Choose your background! We offer three different backgrounds for your letter from Santa Claus, including a North Pole design, an image of Santa waving from a snowy blue background and a letter showing Santa with his bag of toys. – Choose your text! You can choose from three different letter formats to personalize your child’s Santa letter. For each letter, you can add 6 details about your child, including his or her name, age, gender, desired toy for Christmas, hometown, and an accomplishment from the year. – Choose your letter package! 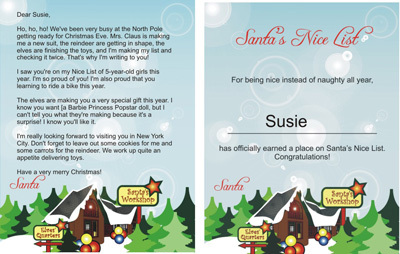 In addition to low-resolution free Santa letters, we also offer high-resolution letters from Santa Claus that come with an envelope and a personalized Nice List certificate that matches your letter design, as shown below. The choice is yours! 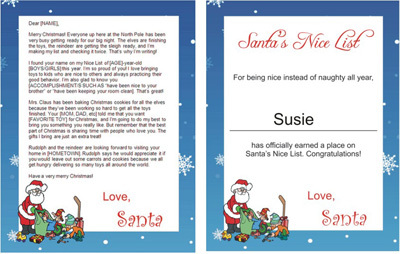 When you choose a premium letter, you also get a matching Nice List certificate and a Santa letter envelope. All upgrades also come with a Santa letter envelope!